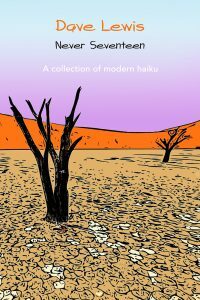 Award-winning writer, Dave Lewis, has recently published his eighteenth book, a collection of modern, haiku-like moments written over the last few years. Published in Oct 2018 by Publish & Print. This is his second full ‘haiku‘ collection, although others can be found in some of Lewis’s other books. “This collection of modern, haiku-like moments is an absolute joy. Beautifully honest, these short, simple poems are extremely easy to read yet are constructed with great artistry and wisdom. Lewis’s poetry is honest, relatable, eloquent yet quite breath taking. He possesses a rare vision and this collection will surely bring any reader to an enlightened state of self-awareness. Powerfully expressed he captures both universal human experience and many of those particular struggles that we face at some point in our lives. A great little present for anyone interested in poetry, nature and our place in the world. This book can be purchased as a paperback for £7.99 (plus postage) or as an e-book on Amazon kindle for £3.99. How to choose the best salon to go to?